My freshman year of college, I got really into plants. I mean, I got really into them... I converted my dorm room into a veritable jungle: the space was overrun with leaves of different shapes and sizes, my windowsill crowded by dozens of terra cotta pots, and my desk rendered useless for studying because of the high risk of knocking one of my precious green babies to the ground. Three years later, a few plants still populate the sunny spots of my home, but more sparsely than before. Many of their stems are stretched out in search of better light, or their leaves have wilted considerably, or they just look generally fatigued and dilapidated from months and months of extended intervals of negligence, followed by sporadic spurts of overwatering and smothering attention. I suppose I could toss these worn-down old plants to the wayside in favor of some fresher, more vivacious looking ones, but I can’t quite bring myself to do that. I know that plants aren’t sentient—they don’t have emotions or even any remote form of knowledge about the world around them. But still, I can’t help but feel a bond with these little green guys who have shared my living space for the entirety of my college career. And as I near the end of this part of my life, I find that more and more, I actually see a reflection of myself in these run-down plants of mine. At the risk of stating the obvious, college is hard. Balancing school, work, friends, family, romance, and your own physical and mental health all at once is a boulder heavy enough to run down even Sisyphus himself. After getting a few years of experience under my belt, I’ve learned certain ways to better handle all the stress that comes along with this lifestyle. Even so, I still don’t seem to have virtually any control over the dramatic mood swings that sweep me up in the thick of the school year. As the growing list of exam dates and assignment deadlines picks up its pace, my motivation to do any of it vanishes entirely; I want to watch Rick and Morty in bed with a bowl of Ramen noodles and do literally nothing else. I usually give in to these moods. Then, of course, after I decide I’ve wasted enough time, I try to yank myself out of the funk by throwing myself at all the tasks I was neglecting—I clean my room, do the dishes, write a poem, practice French. I renew all the goals that just three hours prior I had no desire to pursue. I overcompensate and I make promises to myself that I simply can’t keep. The more I reflect on my journey towards a more stable mental health and sense of self-worth, the more I find that this approach isn’t sustainable for the long term. Much like growing healthy plants, cultivating a healthy self-esteem isn’t something I can simply decide to do in the midst of a fleeting semi-manic episode. My plants suffer when I’m inconsistent—whether they’re too thirsty or drowning, I haven’t reached their happy medium. Whether I’m dragging my feet in dissociation or enthusiastically tackling my daily chores, I haven’t reached my happy medium either. But luckily for me, and for all of us, there are ways to pin down where that perfect middle route lies. If I simply pay attention to my plants, they’ll tell me how they’re doing with their color, their perkiness, their growth, their plumpness. Of course, each person’s journey towards a more stable mental health is manifested in unique ways, and most of these are much less obvious than even a subtle wilting. In my case, if I pay enough attention, I can feel myself fizzling out and failing to follow through on things that should be easy: I show up late to things, I lose track of my obligations, I forget loved ones’ birthdays, I don’t walk my dog. The excuse I make for these shortcomings is always the same: I didn’t have time. But much like my plants, my mental health isn’t interested in excuses. It will wilt all the same. 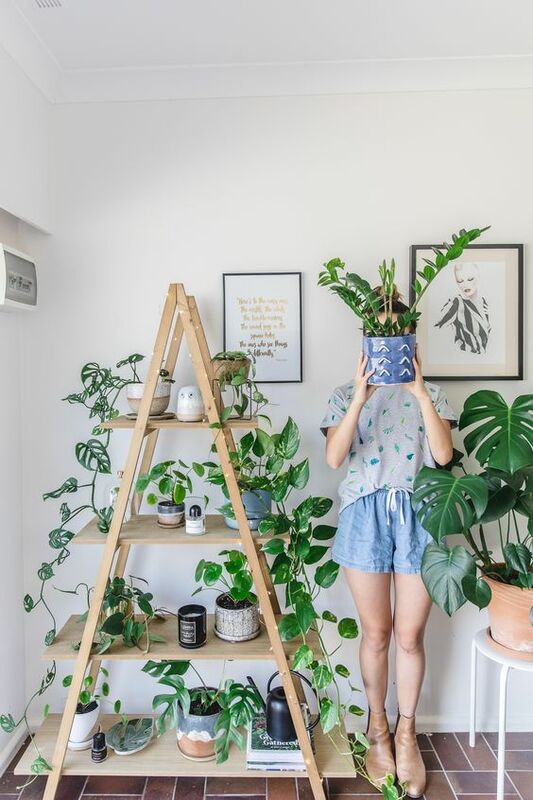 It takes attentiveness, consistency, and discipline to keep a plant alive, even when watering your plants feels like the last thing you have time to do. Cultivating a strong mental well-being isn’t a decision you can make on a Friday afternoon, it’s a commitment you must honor on a Wednesday morning. We live in a world that makes it overwhelmingly easy to fall into periods of self-doubt. I’ve been seeing more and more posts on social media about “choosing” to love yourself. While I think these posts are meant to empower and inspire, I also feel like they imply a philosophy of self-esteem that is fundamentally unsustainable: loving and respecting yourself is not a cerebral decision that comes out of a fleeting moment of inspiration from a brief, well-presented quote on Instagram. It comes from the boring choices that you make on a day-to-day basis; it comes from consciously analyzing your thoughts, words, and actions; it comes from taking an active role in fulfilling minor and menial responsibilities. It’s not an easy, immediate, or attractive approach—perhaps that’s why it’s been so overlooked by the social media realm—but behind every Pinterest-worthy succulent terrarium there are hours of dirty hands and careful watering. It would be naive to expect one without the other. I said earlier that I see my reflection in my plants, and that’s true. But beyond that, I also see my redemption in them. I see a long string of small, unglamorous actions that will hopefully culminate in a verdant flourish whose well-being is remarkable even to those who know nothing of my history with these plants. I’ve still got a long way to go until I reach that point, but before we can thrive, we must know how to survive. Before we can overtake a windowsill, we must first put down some roots. Before we are able to love ourselves fully, to seize the day, to be the best people we can be—we must first get out of bed, brush our teeth, and water our plants. I’m an Iowa-born, 21-year-old student at the University of Oklahoma. I primarily study English Literature but I also dabble in Spanish, History, and Philosophy. When I’m not doing schoolwork, I spend most of my time bouncing between various hobbies—learning languages, playing guitar, reading, camping, volunteering, doing stand-up comedy. I’m a mother of one dog and one chicken, and an aunt to a very cute human. If I’m lucky, I’ll get to remain a student for a long while to pursue a doctorate in English before going on to teach literature at a university.